Staten Island “Reinvented” By The World’s Tallest Wheel. Earlier last month, I had the most amazing interview of my career. I had the honor and privilege of sitting down and talking with Richard Marin, the developer of what will be the world’s tallest observation wheel, which is set to be built within Staten Island’s St. George community. In all of my research about this observation wheel, the retail outlets that will coincide with its construction, and all of the other revitalization efforts taking place across Staten Island’s North Shore, I never expected to learn so much about such a massive undertaking in such a short period of time. As the wheel’s developer, Richard knew every last detail, practically, every inch of the structure, and was able to share with me his vision of what the wheel could bring to Staten Island and New York City. Of all the things I learned in that interview; besides information about the design and construction of the structure and the many experiences it will provide its passengers; I was really moved by the sheer magnitude of the project and what it will mean for Staten Island’s North Shore. Not only will Staten Island’s North Shore landscape and skyline be altered forever, but what will also change is the way people see our “forgotten little borough.” Staten Island has so much to offer, and, hopefully, both New York City tourists and Staten Island residents will begin to see the rich history and culture we have here. 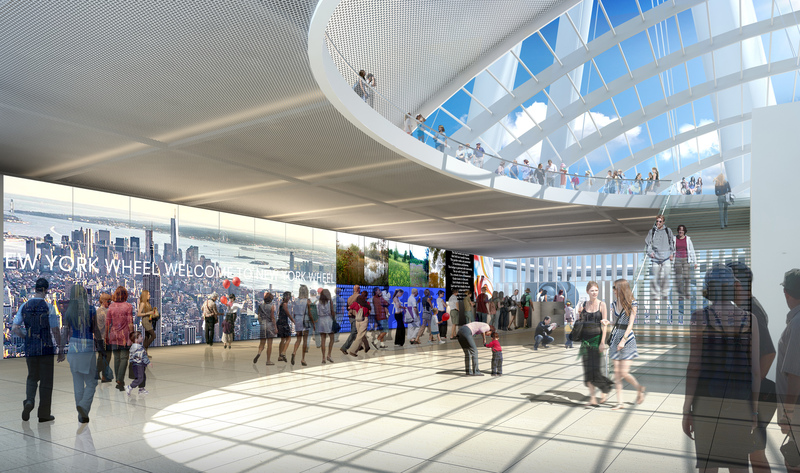 No longer will visitors ride the Staten Island Ferry and turn back saying, “Oh, that’s just Staten Island.” Maybe a 190 meter observation wheel is what it takes to draw our visitors out of the ferry terminal to explore. And, while they are here, hopefully they will get a lovely taste of what we Staten Islanders have always known: there are plenty of “best-kept secrets” here just waiting to be “discovered” all over again. You see, Richard doesn’t see the wheel as just a structure that will be placed on our North Shore. Rather, it is a landmark, a new identity, built into the very heart of Staten Island. It is there to showcase New York City and Staten Island and its presence will inevitably become a part of our unique history. In my video interview with Richard, he mentions that the wheel will be three things: visual, technological and sustainable. No doubt, this observation wheel will provide a visual effect as its views showcase the beauty of New York Harbor and the Manhattan skyline. Technologically, it will be a strong example of what advanced technology has to offer and the amazing things human beings can imagine, engineer and create. Lastly, it is a reminder that, like the energy that drives the wheel (produced through sustainable means), our energy, our spirit, and our drive is also continuous and sustainable, no matter what befalls upon us. As a native Staten Islander who is so passionate about our borough; that is how I see this wheel: as representative of us. Just like Richard describes in the interview, the 17 million-pound structure is so delicately balanced on the axle in its center. And it is that perfect balance that allows the wheel to move so smoothly, using so little energy. Like the wheel, we all have a “center.” It is what drives us to move forward, what strengthens our resolve, and what allows us to branch out while still keeping us grounded. And so, as this new landmark “reinvents” us, we will welcome all it brings our way, in our own, “Staten Island” fashion. My favorite feature…besides the option of having catered dinner parties in a wheel capsule, the augmented reality screens built into the capsules’ glass is something I look forward to seeing. This is such an exciting time to buy a home on Staten Island! Please feel free to check out my website for information about the home buying process, local attractions , news and listings. Contact me on Facebook or Twitter.